Aimed at children aged between 3-6 years of age (all children should be accompanied by an adult). These sessions are based around developing cricketers of the future both boys and girls. The aim is to develop athletic skills, very basic transferable cricket skills, teamwork and most importantly of all to have fun! All sessions are 10-11 outside at King Williams College (on the astro turf cricket pitch side). The cost is £2 per session (paid on the day) and all new participants will receive a free Cric Start t shirt. Please email Sally Green sallygreen82@hotmail.co.uk to register your interest. Following on from the success of the Feb half term camps we have extended the Easter camps opportunities. We have booked both halls at Bemahague to allow a mixture of ages to run side by side and will also be using Bemahague for the younger ages too. There will also be a camp running April 1st & 2nd which has been requested as the Buchan break up a week earlier. These days will be a great opportunity to prepare for the season. The Isle of Man Cricket Association has joined forces with Isle of Man Creamery to give every squad player a free pint of milk as part of Nutrition and Hydration Week which is the 11th to 16th March 2019. Isle of Man Creamery will be at squad training at 2:30 between the U12s and the U13s training sessions at the NSC on the 16th March. Nutrition and Hydration week aims to highlight, promote and celebrate improvements in the provision of nutrition and hydration locally, nationally and globally. The IOMCA has provided nutrition workshops in the past and continually encourages all players to have a healthy diet. Milk is an important part of a cricketer's diet as it builds healthy bones and teeth, serves as a source of energy, builds and repairs muscle tissue and maintains healthy red blood cells. The IOMCA and Isle of Man Creamery are looking at the possibility of having all cricket teas for club and representative squads to be based solely on Manx produce in 2019. The second set of winter cricket activities being run at King Williams College have been released.. These are the second set group of sessions being run under the new Cric-Start programme. The IOMCA's newly branded community development programme to boost playing opportunities for all ages and abilities. After the first round of activities where nearly every set were fully booked we have decided to continue with the Cric-Kids, the 3-6 year olds and then put an emphasis on the 'cricket family'. There are parent and child opportunities and an all Mums and Daughters section included in this round of activities. ​Download the file for details of available options and how to enrol. The Isle of Man Cricket Association is joining forces with Girlguiding in the Isle of Man. Girlguiding Isle of Man is the island's largest voluntary youth organisation comprising 65 groups catering for ages from 5 years to 26 years. Girlguiding IOM includes Rainbows (5-7 years), Brownies (7-10 years), Guides (10-14 years), Rangers (14-18 years) and the Senior Section (14-25 years). Each of the Girlguiding groups across the Isle of Man will be offered a free soft ball cricket taster session to help promote girl's cricket across the island. So far it has proven to be very popular! The IOMCA will be running half term camps for players between 7 and 16 years old. Due to previous popularity we will be running camps at Bemahague school along with King Williams college. The camps are for 9-11 year olds, 12-16 year olds and 7-10 year olds. More details, dates and booking info can be found on by opening the flyer. EPP players Eddie Beard and George Burrows had the privilege of giving a presentation at the 18th Manx Youth Games launch on January 14th. They spoke of their journey from Manx Youth Games kwik cricketers to Isle of Man internationals competing on a world stage 10 years later. Their presentation was in front of the Minister for Education, Sport and Culture Mr Cregeen, a number of MHKs and HSBC representatives. They then gave an interview to Isle of Man radio. Accompanying their presentation was a video which can be seen on the EPP page. Manx Youth Games sessions start week commencing January 21st in all regions and new for 2019 is a girls only session. The Manx Youth Games is to be held at Cronkbourne Cricket Club on May 18th. For more details please look at the Manx Sport and Recreation page under Community. The IOMCA have released details of their first group of winter cricket activities being run at King Williams College. These are the first group of sessions being run under the new Cric-Start programme. The IOMCA's newly branded community development programme to boost playing opportunities for all ages and abilities. The first of a series of fast and spin bowling clinics took place on Saturday 8th December at the NSC. Players were selected with a view to representing the national team in the future. The bowlers were given the opportunity to have their actions filmed and then specific areas were reviewed. They were then given certain intervention drills and training methods to develop their particular areas of focus. The first session was based around the fast bowlers looking at their bases and alignment and the spinners focusing on grips and spinning the ball big! The fast bowling group were principally selected due to their physical attributes and in particular height with a view to finding a 6 foot plus 90mph bowler of the future. The IOMCA are currently looking at ways to promote its activities and engage with the wider community and as a result have launched a new Facebook page. Congratulations to George Burrows, Eddie Beard, Ed Walker, Charlie Beard, Carl Hartmann, Jacob Butler, Luke Ward, Nathan Williams, Dollin Jansen, Joe Humphrey, Lucy Barnett and Tom Ward who form the Emerging Players Programme for 2018-2019. This is down to their hard work last season and notable performances for their clubs and in IOMCA representative games. Please see individual pages in the Emerging Players Programme section for more information. Due to the numbers and performances at trials the IOMCA has decided to increase their number of age group squads from U10, U12, U14 and U16 to U10, U11, U12, U13, U14 and U17 for the 2018-19 season. The individual squads are in the age group pages in player pathway. Congratulations to those players selected. After another season seeing more games, runs and wickets it is worth acknowledging the individual performances of players. This list of players acknowledges the achievements of players who have scored over 1000 runs, taken over 50 wickets as bowlers or completed over 20 fielding dismissals. Detailed reports of the IOMCA Under 10, 12 and 14's performances in their festivals in England are available to view in the player pathway section and their respective age group. Law Changes video and Player Behaviour tool. The close season has seen over 200 rule changes to the laws of cricket. The ECBACO have produced a simplified video which explains these in a way you will enjoy updating yourself with these essential changes. Kit to Sri Lanka Update. After an earlier appeal the clubs on the Isle of Man rallied round to donate kit which is being delivered by Rob Weight to promote cricket in Sri Lanka. Rob Weight is heading off to Sri Lanka in March next year with the Somerset over 50's. They are also looking at supporting the local communities and donating some equipment. If you have any unwanted kit please get in contact with Rob and he will arrange collection.
" A big thanks to everyone that donated their old kit, the package from the IOM has arrived in Sri Lanka and I will be in Colombo next week to hand it over to a local charity. The response from IOM was fantastic and with the equipment collected from the other Somerset players I'm sure many kids out there will be using the kit and most importantly playing cricket." The IOMCA have secured an increased scorecard grant due to the activity on the Island and as such have put together certain initiatives to benefit cricket and its growth. The following initiatives are in place and may be something you as a club would like to discuss. The IOMCA have invested through MSR into an initiative which will look to give every child (primary school age) the opportunity to play cricket and hopefully then join one of our clubs. During the Primary schools sport partnership phase (easter to TT) there will be 65 days coaching offered between schools where a specialist coach either Sally Green or George Burrows will go into primary schools and try to enthuse them into joining a club. Outside of this we are also delivering in 2 or 3 schools per half term a 5 or 6 week programme which is targeted to reception and key stage 1 children with a view to develop their all round athleticism (physical literacy) and again see if we can get these children into clubs early. This will be using the CricKids initiative we have run for the last 3 years and all clubs are encouraged to sign up for this and become a host club. Training will be given to coaches or parents as to what to deliver at no cost and will hopefully bring a future generation of cricketers along. To enhance the playing experience at clubs all clubs will look to have minimum standard ground requirements. These will be confirmed in due course after consultation but it is likely to be sight screens, electronic scoreboard and boundary rope for premier league clubs. The IOMCA will support clubs in buying these and will speak to clubs individually to assess their requirements. All purchases will have to be through Durrant cricket as they have agreed to become our equipment supplier and will offer special rates to the IOMCA on their products. The IOMCA have allocated a sum of money which clubs can bid in to to cover the costs for NEW activities which may bring new players into clubs. Clubs can access between £200 and £1000 in supporting these initiatives. Clubs will need to write an outline plan for these activities and at the end produce receipts etc to show the money has been purposefully spent along with numbers and details of the participants involved. There will be annual priorities like Women and Girls, modified games etc. Again more details will follow but please start to think how you can engage in this. 2018 will also see us starting to look at developing an indoor centre which can host all year round activity and cater for the growth we are seeing in our sport. Please share this info with your club members. ​Please see below to download a copy of the new ICC Playing Handbook 2017-2018. It is 400+ double sided pages which is twice the size of previous handbooks courtesy of the playing conditions, which have doubled in size as they now incorporate the Laws of Cricket (previously they cross-referenced to the Laws instead of being inclusive). Rob Weight is heading off to Sri Lanka in March next year with the Somerset over 50's. Whilst there they are also looking at supporting the local communities and donating some equipment. Full details are on the PDF below. ​Your support would be greatly appreciated. ICC Regulations on Cricket Helmets. The ICC have released their regulations for the use of cricket helmets. These will be strictly monitored in ICC comps but should also be observed when purchasing kit for increased player safety. Released 2 years to the day after the tragic death of Phil Hughes it is an event nobody wants to see happen again. This note is to remind all Boards and their teams that from 1 January 2017, only helmets certified to BS7928:2013 shall be permitted to be worn by players when batting in international cricket matches. While it is not compulsory to wear a helmet at all times when batting, when a helmet is worn it must be certified to the new British Standard. This decision was made by CEC in June this year, and the ICC Clothing & Equipment regulations have been updated to reflect this decision, with enforcement of the new helmet requirement commencing on 1 January 2017. The issue will be policed in the same way as other clothing & equipment breaches, with the ICC Cricket Operations department being notified of potential breaches by match officials, with the video footage then being reviewed to confirm a breach before any notice is sent to the player’s Board. A player continuing to wear non-compliant helmets after 1 January will be given two warnings (only one warning per match) before sanctions will apply. The ICC and its Members have made this decision to ensure international cricketers are wearing the safest available helmets when playing international cricket, and Members have an important role to play in ensuring all their players are wearing British Standards compliant helmets. It is strongly recommended that each Board identifies an internal process by which players can check whether their helmets are compliant or not, and that process be included as the last slide in the presentation. In recent international matches, there have still been a number of players wearing non-compliant helmets when batting, so please discuss this with all players in your team as soon as practical. If the ICC can assist your Board in identifying particular players that have been wearing non-compliant helmets, please get in touch with Clive Hitchcock or myself. The ICC does not want to have to apply sanctions for players wearing non-compliant helmets, so please work with your players and the ICC to ensure that the safest possible helmets are being worn prior to the introduction of these regulations on 1 January. The world of sports psychology can be as complex as an athletes mind when under pressure. Dr Stephen Peters author off the chimp paradox has started a company to explain his theory of the chimp brain. See below for details of how to enrol to attend. The 2016/17 development of excellence squads resumed last night (12th October) with the first session being the combined fitness and fielding for the newly formed academy and the new intake of emerging players. The session started with an intro to players and parents from coach Greig Wright followed by a brief talk from the academy players to the EPP players on the programme from their experiences last year. Technology can't and shouldn't be avoided as a tool to improve player performance. Training over the winter months can be a toil particularly for bowlers with batters in nets just teeing off and every ball (in their mind) clearing the boundary for 6. To assist bowlers in particular the IOMCA have invested in PV one from pitchvision. This system will allow a digital approach to bowlers allowing them to record all their deliveries over a period of time and monitor their progress with accuracy, movement and speed. The system also has video capability to record them and allow them to look at their actions improve and their results get better. Bowlers can also sign up to a cloud identity so they can view all this anywhere on tablets and smartphones. Following the reviews of the junior, senior and performance committee scheduling is already taking place for the 2017 domestic and performance calendar. There was a common agreement from all clubs junior and senior for more cricket. Increase in age groups and extending the season. To accommodate this there needs to be a slight adjustment in night for certain competitions but these fall in with the requests by the clubs. Sundays - Cup rounds (if required) reserve days, performance cricket. ​This with the dates being from Saturday April 22nd for certain cup comps finishing on September 3rd with cup finals. These recommendations will be discussed at the next round of meetings so please pass on your thoughts to your club reps.
See document for the schedule for training sessions for coaches and welfare officers run by Manx SDU. The safety of young players in sports clubs is paramount for a positive experience and vital for the clubs/coaches to ensure they are appropriately covered for insurance purposes. Details of course dates and how to enrol are all here. The increase in numbers and standards of cricket in 2016 has led to a review in the structure of the player pathway. Team Sky and England Rugby’s head sports nutrition consultations are to give local athletes and coaches hints on how their diet can improve their performance. Dr James Morton and Professor Graeme Close will kick start year two of Isle of Man Sport’s Coaching Development Programme at a seminar on September 24th. They will help educate local athletes and coaches on how to optimise their nutrition to maximise performance. James helped Team Sky secure another victory at the Tour de France with Chris Froome and will share his expertise in performance nutrition for endurance athletes. Graeme, the head nutritional consultant to England Rugby and a former professional rugby league player, will talk about nutritional demands for team and power-based sports. Graeme is also the lead nutritionist to Team GB ski and snowboard and supports Isle of Man winter Olympian, Zoe Gillings-Brier. Trevor Christian, who coordinates the Coaching Development Programme, said: ‘It is a real coup to be able to bring two of the world’s leading experts in sports nutrition to the Isle of Man. The event has been made possible through sponsorship from Next Level Nutrition, a new business offering sports nutrition services. Angela has just finished her MSc in Sports Nutrition at Liverpool John Moores University, under the guidance of Graeme and James, who are based there, and she will deliver a section of the seminar. The event will be held at Keyll Darree Lecture Theatre, Braddan, from 9.30am to 12.30pm on Saturday 24th September. Call Trevor on 01624 688590 for further details. The final squad for the ICC competition in Sweden in August has been made and is available to view. A more in depth overview will follow soon on the tournament structure and the squad. The 2016 Junior element of the Super 2's has seen the prelim combined rounds played with some great performances from the newly formed development of excellence squads. Tomorrow (June 15th) see the start of the touring season with the MCC playing the first of our select XI sides. A change in format this year sees the IOM not playing an Under 21 side and the national side but 2 select XI teams. This sits better with the selection format for this years ICC comp of picking from league sides who are in form rather than having an all year round selected group to choose from. Over the course of the 2 fixtures there will be 23 different players representing the Island against the MCC with a mixture of youth and experience in both games. If you have time all are welcome to come and support. The matches are being played at King Williams College on Wednesday and Friday, both 1pm starts. Sides and results can be viewed on the IOMCA play cricket sites. To grow cricket on the Isle of Man it is essential we keep things fresh and where needed competitive. Through June there are a number of touring sides visiting the Island to play representative squads.The annual visit of the MCC commences on the 15th June with the MCC vs IOM Under 21’s, the 16th the MCC play a KWC select schools side and the visit closes on 17th June with the MCC vs IOM national side. All of these fixtures this year will be held at KWC. Saturday June 25th it is the turn of the youngsters and Altringham Grammar will be visiting the Island and will compete against an Under 13 IOM DofE select XI and an Under 15 schools XI both of which will be 40 over matches. There will also be some fixtures against the KWC school and staff sides. A busy June finishes with Tuesday 28th June Under 21's vs Merseyside 40 Overs and Wednesday 29th June IOM select vs Merseyside 40 Overs. These games whilst keeping things fresh and entertaining sides and hopefully encouraging them to come back to the Island are also great to prepare our squads for their festivals and tournaments in Malvern (Under 11's) Bromsgrove (Under 13;s) and Sweden (National side). The IOMCA are proud to announce new members to our team. Callin Wild, MBL Financial and Oceanic have pledged sponsorship to our under 11 and under 13 age groups. . The monies pledged will be used to support the squads and what better way to support players and parents and promote our sponsors than providing playing kit for the squads. The support has meant huge reductions in cost for the playing kit and with so many fixtures arranged we are confident the lads will be seen all over. ​The fact people want to be part of our team shows cricket is moving forward on the Island. After a successful AGM where the clubs agreed proposals put forward to relax registration rules and focus on increasing playing numbers in clubs to grow cricket on the Isle of Man the senior committee had its first meeting to finalise league structures. The positive move from clubs has seen a transformation in the league and cups in numbers and also formats. The Monday night Cain league will see 8 teams competing across 2 divisions of 4. These will play home and away until mid season and there will then be a 2 up 2 down promotion and relegation with the leagues then being rescheduled and a further 6 weeks being played to finish the league off. The Wednesday Forrester league will see 11 teams entered who will all play each other once through the season. Discussions on a playoff to determine league places are still in place. The premier league remains at 6 teams even after losing Valkyries to the longer format (they will still be playing midweek) as we see the entry of a schools XI which will be made up of promising youngsters and senior teachers and club players. The Cups will be played at the start and the end of the season this year. The Tinker cup (40 overs) kicks the season off on April 30th with 8 teams competing this year. Castletown veterans will be bringing some experience to the comp as they start the campaign against Ramsey. Other ties see Peel & St Johns the 2015 winners against the schools XI, Castletown host Cronkbourne and Crosby play Valkyres to complete the draw. The Blincoe matches will all be weekends this year to allow all rounds to be the same format (2 innings, 16 8 ball overs). The prelim rounds see Cronkbourne play the schools XI and Finch Hill playing Crosby. The Quarter finals are in June with the semi's and the final in August. The drive and desire of the clubs to move forward must be applauded and 2016 will see lots of cricket being played on and off the Island with the new Under 11 squad travelling to Malvern, the 13's to Bromsgrove and the national side competing in Stockholm in August in ICC europe division 2. ​see below for the draft senior fixtures, junior and performance fixture fixtures will follow soon. The IOMCA are running a series of camps over Easter to prepare players for the season. aimes at upscaling current players and engaging new players these camps will have cater for all levels of ability new and experienced. The camps are delivered by IOMCA coaches and players so will ensure quality for all and will ensure the correct balance of Fun and development. ​Isle of Man cricket has a large year ahead in 2016. The national side will be competing in ICC Europe division 2 competition later in the year and the newly formed under 11 and under 13 squads will be heading over to compete in Malvern and Bromsgrove respectively against English county age group sides. However with all of those competitions happening later in the year it allows us to focus on domestic cricket early in the year. Our aim is simple: to get as many people playing and enjoying the game as possible, young or old, male or female. Why wait until the Summer to play? To start 2016 we are giving away 5 sets of equipment which will allow you to simply 'just play' a set of Gunn and Moore wheelie bin wickets, a Ram cricket plastic bat and a tennis ball. everything you need for a game on the street. 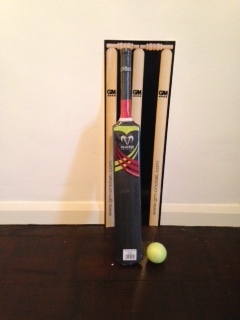 ​simply email the words 'I want to play' to: iomcricket@hotmail.com for a chance to win. the draw will be made on 17th January. NSC current status regarding the halls and the bookings. The damage to all halls is extensive and they are beyond a simple cleaning. There is no definitive date available yet as to when the halls will be available to use so ‘NO BOOKINGS WILL BE TAKEN UNTIL FURTHER NOTICE’. Without the use of the NSC it is key we try to maximise facility use of other venues and give all sports and clubs the best chance to prepare. As always we encourage clubs to communicate with each other and if there have been alternative venues booked see if they can be utilised by more than one club and also share costs. Also bear in mind we are a summer sport and other sports may require facilities for their winter match play programme or upcoming tournaments so please take that into account if planning for long winter training schedules. Try to think out of the box short term and think how we can develop all round players and different training may be required to develop players which could reap long term benefits to the players. These could be astro’s, school halls, community centres all of which can serve a purpose if the right training and equipment are used. I will be meeting a few people to discuss alternative venues early next week and will keep you informed of any opportunities. If clubs have any ideas please contact me and I will post them on the website. The floods which have hit the Island have heavily effected the planned activity in the short term for cricket. Initial cancellations for the emerging players training this morning (Friday 4th Dec) the outdoor training for all squads tomorrow at Blue Point are the short term programmes effected on the excellence side. With great regret we will also have to cancel the coaches workshop on Sunday covering wicket keeping and fielding. It is hoped all other planned activity can go ahead as planned and any alterations to scheduled activity we will give as much notice as possible. See the below booking form for some opportunities to attend workshops covering the skills of batting, bowling and fielding. These workshops will give an insight into the basics and look at some more advanced options to help players improve. The workshops will benefit players, coaches and parents develop their knowledge and game. There will be practical elements for all to have a go if they choose to. If you have any questions or would like to book on the course please email: iomcricket@hotmail.com or download and complete and return the form below. The Isle of Man cricket association is committed to developing cricket at all levels and through all aspects. To assist clubs and schools cater with growing numbers of players and develop players skill levels we will be running a UKCC2 certificated coaching course this winter. see details of the course on the form below.